Concrete patios with cracks, pooling water, surface deterioration or that appear old and aged require certain maintenance and repairs in order to continue withstanding the test of time. Concrete patios are victims of nature, such as fluctuating temperatures, rain and snow. Covered concrete patios are better protected than uncovered concrete, but they are still going to show signs of wear and tear over time. If you’re ever in doubt about the state of your concrete patio, contact the trusted team at Turnbull Masonry. We are happy to look over your patio and provide an estimate for any repairs you may need. Here Are Some Common Signs Your Concrete Patio Needs Some TLC. If you notice cracks forming on the floor of your patio it may indicate the need for repairs. Minor cracks are unavoidable and not a big deal most of the time, but once cracks start to form they are only going to get worse. Weeds may grow between the cracks forcing them to expand, and water has an easy entry point. Once inside, water will continue to freeze and thaw, creating pressure on concrete that eventually causes it to crack even more. The width and depth of cracks must be taken into consideration in order to identify the most cost effective solution. Patching or adding sealant works for cracks that measure no more than 1/8-inch wide, also known as hairline cracks. Larger cracks that measure up to ½-inch wide require concrete-repair caulk. If you notice standing pools of water building up on your patio it’s a clear sign that you have drainage issues. If water does not properly drain off and away from the patio it will eventually create damage. Since water is the leading contributor to all kinds of concrete and masonry damage, drainage solutions are adamant to long lasting concrete patios. Spalling is defined as actual pieces of your concrete patio chipping away and falling off. In order to protect your patio against future damage this needs to be addressed as soon as possible. Otherwise, the damage is only going to get worse. Spalling may relate to faulty construction in which too much water was added to the concrete mix, or the concrete did not cure properly after installation. The importance of quality construction is unmatched when it comes to the longevity of any surface. If you notice your patio is chipping away and actively deteriorating it doesn’t typically mean your whole patio needs to be ripped down and rebuilt. Resurfacing your patio with a ½-inch concrete overlay may provide the solution necessary to fix the problem. At some point in time every patio begins to look worn out and old. Just like anything in life, even the best built patios are not going to last forever. That doesn’t mean you have to replace your entire patio. As long as you take care of repairs and maintenance in a timely fashion, some simple restoration work should make your patio look like new again. Oftentimes, patios just need resurfacing, waterproofing and sealcoating to look good as new. Use colored paint, dye or stain to infuse your patio with a new pop of color. 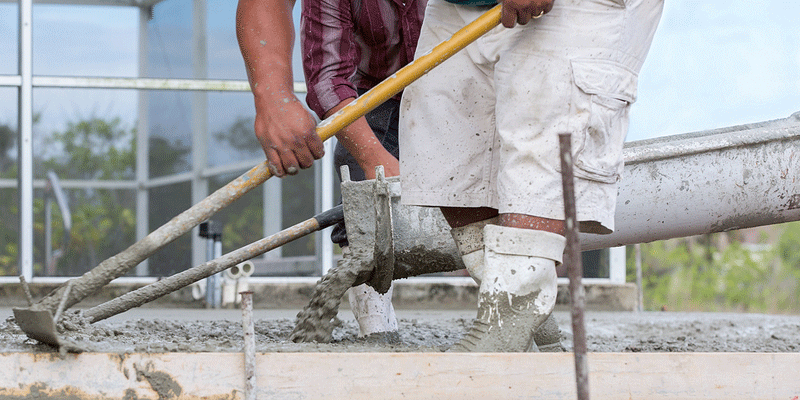 Concrete is a porous material, which means paints and stains absorb nicely into the surface. Prior to applying paint, your patio must be properly cleaned and prepared. You should always test out a small area of concrete with paint prior to applying over a large area. Once you paint your patio it will require repainting every so often. Add a new face to your patio by applying tiles, bricks or other masonry materials on top of the existing slab. This gives off the appearance of an entirely new patio without actually building a new patio. A thin later of cement will be added on top of surfaces before the new material is applied on top, followed by the appropriate non-slip sealant. No matter how worn out your patio appears, Turnbull Masonry can make it look like new again! Contact us today for an analysis of your concrete patio and a competitive repair quote.